Pasta with lobster is the king of the seafood pastas. 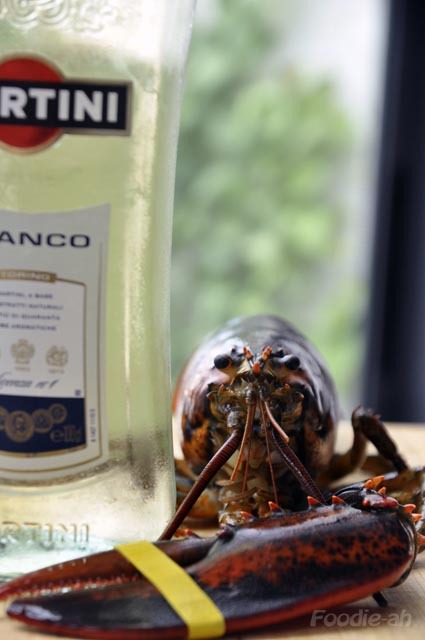 This recipe utilises live lobster meat, egg fettuccine, and a dash of white vermouth to give it a tad of sweetness. You can make the egg fettuccine yourself, or buy them dried at most supermarkets (I bought the "Rustichella d'abruzzo ones at Liang Court, and they are very good). 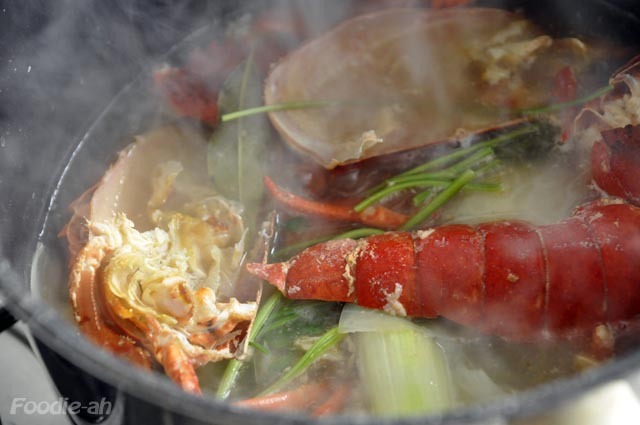 Kill the lobster and patiently remove all the meat from the shell, then sprinkle it with salt. Quickly fry the shells in olive oil with the onion chopped into 4 and the celery chopped into a few pieces. 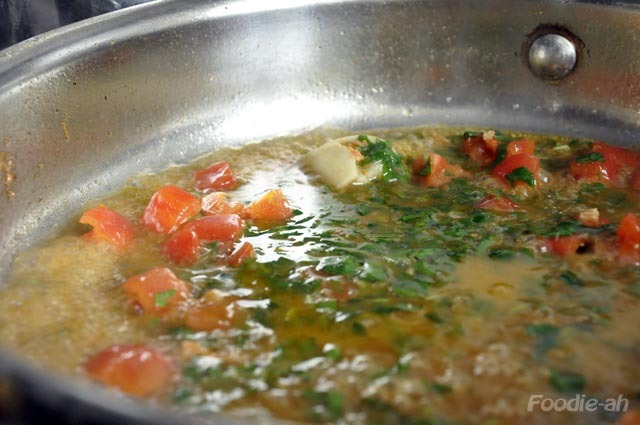 Cover with 300ml of water (or until covered) and bring to the boil, then reduce the heat and keep to a gentle simmer. In the meantime, while the stock is building up flavour, chop some parsley and put the stems into the stock pot. Remove the skin from the plum tomatoes, cop them and sprinkle them with salt (make an incision, boil them for 20 seconds and quickly place them into ice water to facilitate the operation). Add the skins to the stock pot. Crush a couple of cloves of garlic. Give the stock about 20-30 mins to get some flavour, and enrich with some fish stock if you have it. Remove from the fire, filter and set aside. 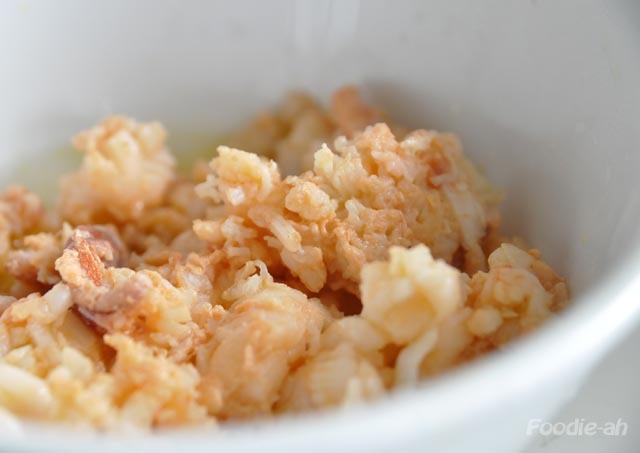 Pour some olive oil into a large frying pan, then quickly fry the lobster meat cut into large chunks. 30-40 seconds should be sufficient for it to be cooked and retain its juices. Remove the meat from the oil, then add the garlic and chilli and fry them until golden. Pour the wine and vermouth and deglaze the pan. Reduce to a half, then add 2/3 of the tomatoes and pour about 200ml of the lobster stock. Reduce to a half, then add 3/4 of the parsley and turn off the stove. 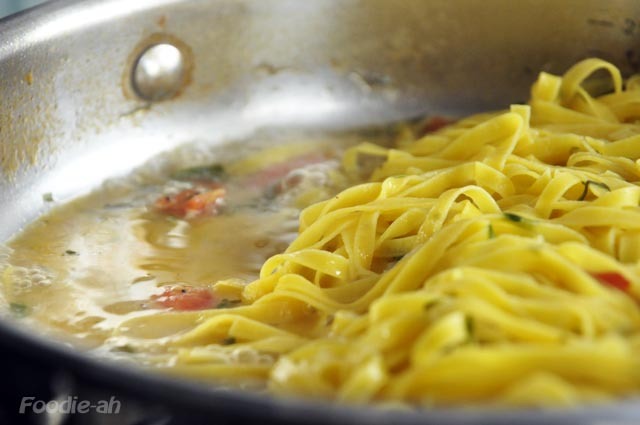 In a pot of boiling water, cook the fettuccine for a couple of minutes (read the cooking instructions on the pack), then drain them, put them into the frying pan and complete the cooking for another 2-3 minutes together with the remaining chopped tomatoes, parsley and basil, adding more stock and salt if necessary. Melt in the optional knob butter if you prefer the sauce to be more rich. 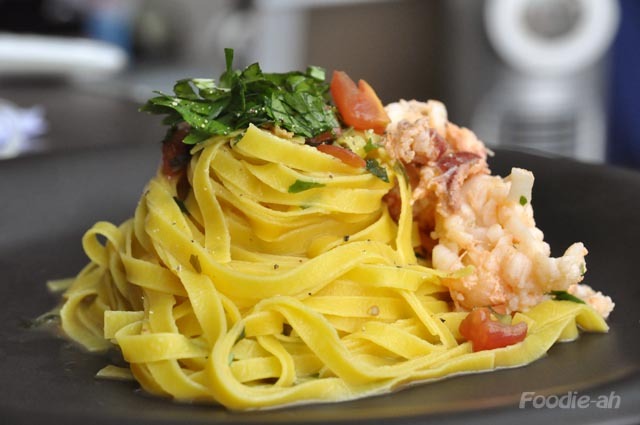 Finally place the fettuccine on a plate, top with some fresh parsley and basil, pour a gentle amount of sauce and arrange the lobster meat on the side. Sprinkle with black pepper.